The many a story of a EU citizen has been aired in the past six months. The way these people have been treated should enrage anyone with an ounce (yes that’s right – not a gram) of decency. Yet there are even further repercussions to follow that this kind of disrespect and disregard for the inhabitants of this, once indeed a Great Britain, have been allowed to take place. The reason Great Britain was great was in its treatment and respect for the civil and human rights. Great Britain, let us not forget, survived the death of the British Empire not by fighting every insurgency but by collaborating with most of the newly born nations – the nations and peoples of the Commonwealth. Sometimes even taking credit for the achievements of such new countries, Britain nevertheless grew and gained strength and influence in stature, culture, and economy. This was all thanks to cooperation, collaboration, and tolerance that British society promoted and adhered to fully. 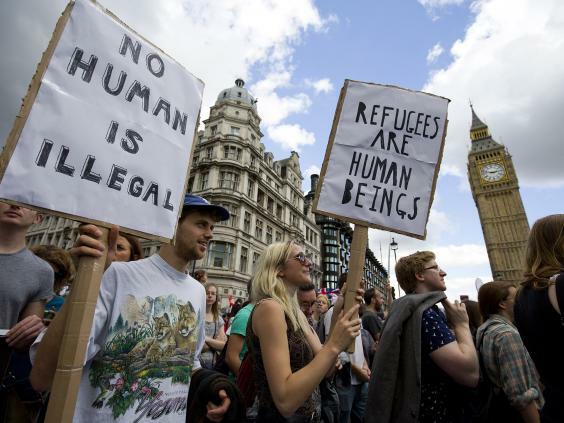 Not unlike America, the refugees, the dispossessed, those who suffered discrimination, persecution, and disrespect in the countries of their origin, were able to build their lives and help the communities of which they became part, here in Britain. Britain has, since the 23rd of June 2016, with literally a succession of little strokes of pen, decided that this was all a complete waste of time. The millions of people’s opinions, rights, and contributions suddenly did not matter any longer. By this I don’t only mean EU citizens, but all the refugees, immigrants, dispossessed and those who were discriminated against, who made their lives here, and helped build Britain the country it is today. Should we go back in history, we could find in each century a multitude of waves of such immigration. I implore you not to take offense if your lot is not mentioned here – it is not of disrespect certainly! But let us only mention some such groups: the Huguenots, the Jews, the Hungarians, and more recently the Yugoslavs – of all ethnic backgrounds. These people all settled, reestablished their lives here, and were hugely grateful for the opportunity. The gratitude of these newcomers becomes obvious when one compares their social mobility with other social groups – and this did not come about because there was any positive discrimination in their favour, but because they were grateful for the opportunity to work, make their families safe, and be allowed to prosper without repercussions and with the knowledge that such prosperity will be shared and passed to the new generations. Their new generations mind you – but also Britain’s new generations – the immigrants and refugees who settled here have been proud that their children would be British. In my experience, in this they would be proud without exception, and thus they contributed to the British society as much as they could. Speak to any such immigrant or former refugee, and the first thing they will make sure they say is that they did not ask for any benefits – for which I am sure, they would have been entitled to at times. But beyond the contribution of these people, and the contribution that their children and families made, there is an even greater aspect that seems to be forgotten. It is the personal experience of what it means to be in a society in which an individual is just a number, disrespected and dispossessed in the rise of populism and autocracy. It is the fact that once this is experienced, more than ever, people are grateful for a safe heaven, and are aware of how good manners, good behaviour, and helping others get along, are crucial and perhaps the most important aspect of a civilized society. I write this as one such former refugee and immigrant. I despise how these two words have become dirty words to describe people who, without any guilt on their part, end up having to leave everything they know, have, and love, and make life from the beginning in a foreign country where they know no one, have qualifications that are not recognised, and do not speak the language. Sure some have trouble integrating. Imagine yourself being in such a situation and judge no one harder than you would yourself. I have a personal experience of it all. Yet it all ended well for me, perhaps because I am a laid back person with a genuine love of English literature and culture. But there is a genuine love and interest of the British people that I saw, experienced, and recognized, for people like myself and my family. When there was no hope, Britain and the British people offered me help and refuge, gave me a sense of purpose and pulled me from the depths of despair of seeing the meanness and cruelty that I was suddenly faced with, realizing that human kind was capable of committing acts of unbearable ugliness. The kindness of the British people, the every ‘please’ and ‘thank you’ that I heard, made my heart grow stronger and my will more determined to do well and to help anyone I could in the only way I could, through education. And so what has happened to me and people like myself since the June 23rd is doubly tragic. It is tragic as we see that those who pulled us out of the depths of our despair, seem unable to make their voices heard. They are not the people to paint graffiti on the Polish shops and shout ‘get out, we won’! And it is tragic for all of those people who became to consider themselves British like myself, and have raised their children and grandchildren as such. We have since began to look for the signs of approval. Am I really accepted? Am I really valued? Do people consider me really their equal here? Is my contribution valued at all? These are the existential questions that are deep and important, and the effect of not having answers to them can be devastating for many such people. They are not to be disregarded as unimportant. So what does, and could, the future hold for all of us, and for Britain? What is the hope and the wish that I have? It is the wish for us Brits, born here or not, with accents or not, to recognize that we do deserve and have our Great-ness only so far as we recognize that the great acts can only come out of friendship, support, acceptance and tolerance. That to have any business and any relationship that benefits you personally is that which respects the other with which you have a relationship. It is really so simple! That there will be nothing great about being a nationalist little island with no trade, no vision and no spirit of collaboration that we can nurture in our future generations. The only reason we survive is the spirit of cooperation we practice as a species, and even our sense of cooperation with other species, the planet, and the universe. We collaborate, cooperate, and through this we grow. This is how we survive – but what is currently taking hold is the belief that collaboration is important only if you feel superior to the other. Someone should make a show about it! But there would be no winners in this game. ← But you’ll be ok! You’re so British, you’re married to a Brit!